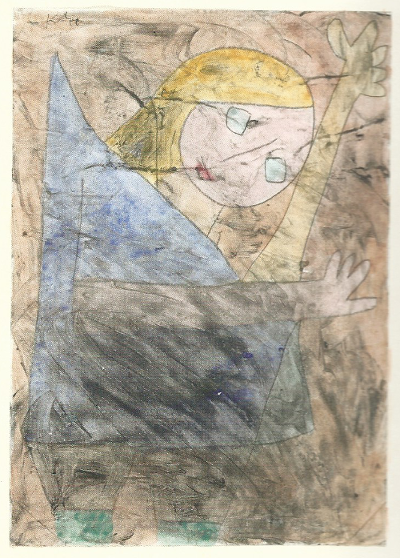 Engel, noch tastend = Angel still groping about , Paul Klee. to be saved. No standard of penitence is set, only despondency is impiety (13/8). We as Arès Pilgrims are apostles. But what do our leaflets read? Just as the news, the politicians, the Sunday sermons do, they reason, "The world is disastrous, unjust, untruthful, merciless, we've got to do something!" Now, this is well-known by people who listen to us and either they are world-weary as nothing fundamental has changed for long or they have their own solutions and are not interested in ours. Only penitence will conquer evil. It is both the norm and the flag of The Revelation of Arès. We are the only ones to preach penitence and for the individual together with the world this is a matter of spiritual life and death at first, and finally of physical immortalization and decline. I will be asked, "Ok, but how many men on earth realize that their personal fate is linked to the world's fate?" Admittedly few, at least for now, and the only means of harvesting the few that are to hear us and make up the pious gent (or kindred), a mist of Heavenly Water on the worlds to save it (Rev of Arès xLv/13-17), is reminding everywhere forcefully that every man, even isolated amid seven billion humans, is the image and likeness of the Maker (Genesis 1/26-27), a co-creator of the world and that no one recreates himself and finds salvation without participating in recreating and saving the world knowingly or unknowingly. I the Creator of the world and of every man that treads it; I do not forgive sins. My Salvation does not result from (God's) Forgiveness; it results from (man's) penitence (30/10). Truth is that the world has to change (28/7). Your harvest of other penitents, because love has to be shared with all mankind. No need of religion, politics, ideology, dogma. No hidden face of anything complicated. This is so simple that, once we have said so, people's inquiring eyes peer at us, because they are living a life more and more complicated, anxiety-inducing, treacherous, in which a lot are just about to lose it, and they wait for us to continue, try to guess the intrications and pressures likely hidden. But there is nothing more, no intrications or pressures hidden. This simplicity might suit humans who more and more loathe institutions, religion, politics, law, rules, constraints, and find it hard to swim against a heavy politico-societal swell which could well turn into a storm. But no, this simplicity does not suit them. At least not from the outset. Man brother, stay Catholic, Protestant, Jewish, Muslim, Buddhist or Atheistic, but be a penitent, change your life (Rev of Arès 30/10-11), because we have to change the world (28/7) from evil to good before it rots and suffers dreadfully by the sin of sins (38/2). Just be a penitent, even if you don't join in the small remnant (24/1). The small remnant is the brothehood that follows on from the prophet's action, believers focused on the real-life practice and spreading of The Revelation of Arès. But people, if they have not fled yet, keep on waiting for something else, the intrications or pressures hidden. Their suspicious curiosity may be due to the fact that changing one's life (Rev of Arès 30/11), get it out of the standard, the modern havoc, requires something they have lost: creative individuality and personality and that they are unready for striving to regain them. Some however say things like, "What you've put forward exists, you know! You can hear similar old teaching in Hindu ashrams, Buddhist or Soto Zen monasteries, Sufi societies, and even in Christian monasteries, in Gurdjieff groups, an so on." No doubt that there are such things as ways of "awakening" or "freeing" outside religion or ethics to pass from a state of being to another state of being. But God through The Revelation d'Arès does not call upon man to find personal salvation through ways which apply only to rare persons capable of following them. He calls for universal spiritual Life and Salvation: Truth is that the world has to change (28/7). The world! With other words God resumes Jesus' Sermon on the Mount (Matthew ch. 5 to 7) which universalizes penitence, and on the move even the small remnant of penitents is not a cream destined for a privileged eschatology, but it is just the rally of brothers and sisters especially devoted and busy. The purpose is the very simplest one: Mankind will never be saved by religion, politics, law, but it will be saved by a lot of men who will become good. God does not even demand that men believe in Him (Rev of Arès 28/12). The Revelation of Arès indeed puts the human masses to the test of the real, so that they may go back to the real, of which He God is the apex. But He is patient, He will show Himself in due course. He is aware that man flees from the real today; even materialism and atheism are escapings from the real, just take the cinema, the most heathen of arts, which plunges the masses into fiction. Spiritual freeing has little to do with philosophic or ideological freeing. This is why we at the very most are existentialist philosophically speaking. On the other hand we are thoroughly spiritual and in search of Life (Rev of Arès 24/5). Yes certainly man, whoever you are, you are spiritual. Only you are not aware of it. Listen to me! The Straight Path (Quran "Al-Fatiha" 1/6) is not in books, not in speeches, not in prayers, but it is within yourself and it is very simple. Come! You can save yourself and save the world!